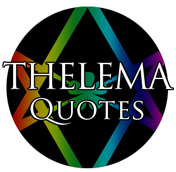 Aleister Crowley quotes on Thelema. Crowley’s thoughts and saying are very similar to what I have believed, even as a “Xtian” child. I had no clue to who he was until I began to study the occult and then I only knew he was a leader of the occult and a Master Magician. And of course I heard of him through Ozzy’s song. An interesting man whom I truly admire. I am for sure going to get some books he wrote as well as other Thelema authors. I have to study this mans mind.